The Best of the Best episode This Sunday on ASAP 18! Timeless beauties Dawn Zulueta and Sunshine Cruz are set to capture the hearts of TV viewers in the ‘best of the best’ episode of “ASAP 18” this Sunday (June 30). Witness the greatness of Filipino talent in the back-to-back-to-back production numbers of jukebox idols Renz Verano, Jude Michael, and Jessa Zaragoza. Love and laughter are set to fill the centerstage with the sweet surprises from Kapamilya heartthrobs Piolo Pascual, Gerald Anderson, Enchong Dee, and Xian Lim; the romantic serenade of ASAP Boyfriendz Enrique Gil, Khalil Ramos, and Daniel Padilla; and the special visit of “It’s Showtime” ‘Kaloka-like’ finalists Santi Felix (Coco Martin), Charmea Viking (Kim Chiu), and Caesar Resurrection (Daniel Padilla). Meanwhile, prepare for the explosive and must-watch showdown of ASAP dance royalties Maja Salvador and Shaina Magdayao in the supah hot clash dance segment ‘MASH;’ followed by the breathtaking Supahdance showcase of Kim Chiu, Kathryn Bernardo, Julia Montes, Erich Gonzales, Empress, Nikki Gil, Karylle, Iya Villania, Gab Valenciano, Ella Cruz, Meg Imperial, Bugoy Cariño, and KC Concepcion. Also, watch out for the non-stop hair-raising concert performances of Gary Valenciano, Martin Nievera, ZsaZsa Padilla, Vina Morales, Sarah Geronimo, Toni Gonzaga, Bamboo, Angeline Quinto, ASAP Pinoy Champs, ASAP Champions, and ASAP Sessionistas. Don’t miss the non-stop celebrations in the country’s longest-running, award-winning variety show, “ASAP 18” this Sunday, 12:15 noon, on ABS-CBN. For updates, photos and to hang out live with the stars at ASAP Chill-Out, visit http://asap.abs-cbn.com/, ‘like’ http://facebook.com/asapofficial, follow @ASAPOFFICIAL on Twitter, and know the latest happenings in “ASAP 18” by tweeting the hashtag #ASAPBigBlast. Be a coach right at your homes and listen if the artists, including a Rihanna look-alike, a former anorexic and voice talent of a popular fast food chain, and a taxi driver will make the cut and impress any of the coaches. Interesting sidelights will also come your way as one artist sings “On My Own” with coach Lea Salonga who starred in the Broadway hit musical “Les Miserables,” and another artist who will make coach Apl de Ap emotional and make coach Sarah Geronimo cry. Who among them will join any of the four teams? Which team will welcome the most number of members at the end of the week? Don’t miss the continuation of the Blind Auditions in “The Voice of the Philippines” this Saturday (June 29), 9 PM, and Sunday (June 30), 8:15 PM on ABS-CBN. Get the latest news and updates about the show and view the exclusive artists’ profiles and performance videos in “The Voice of the Philippines” official website at http://thevoice.abs-cbn.com. Emma Watson lands on the cover of Teen Vogue! The “Bling Ring” actress, Emma Watson is on the latest issue of Teen Vogue Magazine. On her interview, the actress tells the mag that she had no idea the sort of impact she had on popular culture in America. FOX released a schedule premiere dates for Glee and more! Adam Sandler’s first sequel “Grown Ups 2” showing on July 24! After moving his family back to his hometown to be with his friends and their kids, Lenny (Adam Sandler), finds out that between old bullies, new bullies, schizo bus drivers, drunk cops on skis, and 400 costumed party crashers — sometimes crazy follows you. Columbia Pictures presents the new comedy “Grown Ups 2” starring Adam Sandler, Kevin James, Chris Rock, David Spade, Salma Hayek, Maya Rudolph, Maria Bello, and Nick Swardson. Directed by Dennis Dugan, the film is produced by Sandler and Jack Giarraputo. Sandler’s most successful comedy in his long career, the 2010 film “Grown Ups” took the box office by storm as audiences laughed their way to more than $ 260 million worldwide. Remarkably for a comedy star, Sandler has proven equally popular at home and abroad – the film took in over $ 100 million overseas. So, after more than ten years of blockbuster comedies, Sandler is doing something he’s never done before: a sequel. Director Dennis Dugan, who helms his eighth Sandler film with “Grown Ups 2,” says that there are several reasons why the time is right. Opening across the Philippines on July 24, “Grown Ups 2” is distributed by Columbia Pictures, local office of Sony Pictures Releasing International. Visit http://www.columbiapictures.com.ph to see the latest trailers, get free downloads and play free movie games. 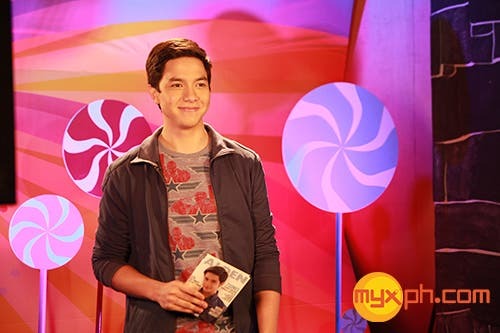 Award-winning film and television heartthrob Alden Richards brings you the best of your choice and your music as he spends time with TV viewers on MYX as this month’s celebrity VJ. Alden will be hosting “MY MYX” from the 23rd to the 29th of June, granting the video requests of fans and viewers on the ultimate “Your Choice. Your Music.” show. Requests can be sent through SMS, e-mail and snail mail. Fans can also upload a video on YouTube to get their requests across. MYX is available 24/7 on SkyCable (channel 23) in Metro Manila and many quality cable companies all over the Philippines. MYX is also on UHF via Studio 23 during choice hours every day. For more information, log on to myxph.com.